Gallery 1608 | Roger Cummiskey - ArtRoger. It was lovely to meet Roger Cummiskey and his lovely wife at Gallery 1608 today. A real gentleman. – Ian Bickerstaff, gallery owner, 30th March 2014. 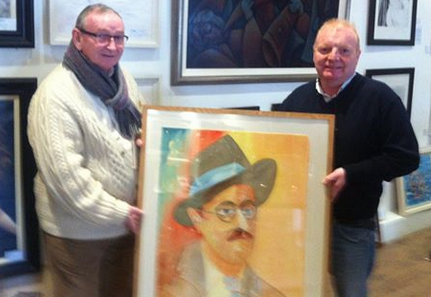 The artist and the gallery owner with the James Joyce original portrait. Northern Ireland will host the opening stages of the Giro d’Italia in 2014. 09-11 May. This stretched canvas is on its way there. 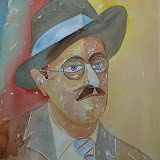 (24 x 16.5 ins).